Active learning is not a new concept within HAPS. Annual conference poster and workshop sessions are chock-full of ideas on how to incorporate more student-centered techniques and personal storiesof faculty experiences with various methods. Nearly all of us likely have active learning terms in our lexicon and the majority of HAPS members would agree we should use such techniques (if not, please see the meta-study by Freeman et al. ). Yet an awareness of active learning and its benefit by itself does not necessarily drive change in our classroom practice. The more change is required, especially when that change is associated with significant effort, possibly even a seismic shift from our past teaching routines, the less likely we are to rush out and try it. And if an instructor is really motivated to find out what most benefits their specific population of students, the thought of developing an actual pedagogical study can seem utterly overwhelming. This is where peer-mentoring and a set timeline can really help. The Community College Anatomy and Physiology Education Research (CAPER) Program is designed to provide the needed support for participating community college instructors. CAPER is an NSF-funded project, with Murray Jensen (University of MN) as Principal Investigator. CAPER is aimed at supporting community college faculty who are interested in identifying how evidence-based instructional practices (EBIPs) impact the community college student population, a population that has been under-studied in the active learning literature. The current cohort of six participants kicked off the project by participating in the HAPS-I Educational Research course in fall 2018. Their culminating project for the course was an educational research proposal they are implementing this spring. A group of additional active HAPSters also participated as mentors in the HAPS-I course, providing feedback on project proposals and helping as needed. Kerry Hull, for example, is heading up an interdisciplinary group at Bishop’s University in Ontario, Canada that provides expertise in experimental design, data analysis, and manuscript preparation. In addition to the studies being conducted by each instructor, all instructors are working with the research team to investigate the impact of EBIPs on reducing student stress and increasing their feelings of academic self-efficacy. If you are attending the meeting in Portland, be sure to check out the CAPER posters, or attend our workshop, to learn more specific details about the project. S. Freeman et al., “Active learning increases student performance in science, engineering, and mathematics,” Proc. Natl. Acad. Sci., vol. 111, no. 23, pp. 8410–8415, Jun. 2014. Submitted by Ron Gerrits on behalf of the CAPER group. Ron Gerrits is a Professor at the Milwaukee School of Engineering where he teaches health-science courses, mainly physiology. His professional interests are science and engineering education. Currently he is one of the mentors on the CAPER project, which includes several HAPSters interested in improving physiology education (which seems to be a group trait of HAPS!). How many of these abbreviations do you know? Where do most students in the USA take entry-level anatomy and physiology? The answer the first question will be at the end, but it’s the second question that is important now. Answer: Community Colleges! Community Colleges are where thousands of instructors are teaching tens of thousands of students lessons in anatomy and physiology every day of the academic year. Students in these courses often have high hopes – they hope to change their lives by gaining the qualifications to enter allied health professions such as nursing, surgical technology, and emergency medicine. But as most of us know, many students do not complete the two-semester A & P sequence, and others complete the course but do not have high enough grades to continue in the program. The course needs to be difficult; it’s a difficult topic. But too many students are failing. I recently gave a SoTL (Science of Teaching and Learning) workshop at a community college that had an attrition rate of well over 50% in A & P. The instructors in the program all talked about students being academically ill prepared for the rigors of an A & P course. Other students, they said, were just too busy with work, kids, and “life” to devote the time required to succeed. “Stress” was a common theme; stress caused by financial problems, family problems, and in many cases academic struggles. In the workshop we talked about different strategies that “might help” students who struggle. We can never “save” all our students, but we can improve the present situation. We can help a few students succeed in A & P who otherwise might fail. Are you teaching at a community college? Are you interested in such a project? If so, read about our project (CAPER) in the text below, which will also be posted on the HAPS List serve later today. College Anatomy and Physiology Educational Researchers (CAPER) – We want you! One topic guaranteed to start up chatter on the HAPS Discussion Board is attrition – the disturbingly high number of students failing and withdrawing from our A & P courses, especially at 2- year colleges. The HAPS Attrition Task Force has spent the past 18 months gathering data to document the problem. The causes are complex, and the solutions equally so, but as HAPS members we posit that how we teach matters. Unfortunately, while many of our members teach at 2-year schools, very little data that we use to inform our practices has actually been gathered at these institutions. We are submitting an NSF grant application to help address this deficiency, and we need participants. We are looking for 6 to 8 instructors at large enrolment community colleges serving diverse student populations who are willing to act as partners and participants in this grant. We want people who love teaching, love their students, and want to develop methods to help their students succeed – especially those who struggle. Our goal is to identify specific classroom interventions that will reduce attrition in diverse student populations. These interventions will target two important components of student success: conceptual understanding of physiology and psychological distress. Educators involved in this project will work together to develop, implement, and evaluate the impact of curriculum and pedagogy designed to influence one or both of these determinants. We know full well that we cannot “save” all students, but we know that implementing some simple methods into our regular teaching practice can make a big difference our students’ chance of success. Here is our preliminary plan, but we are interested in working with grant participants to fine-tune the methods. July to December 2018: Complete a 1-credit HAPS –I course (Title: Introduction to Educational Research Methods) that covers basic principles of instructional design and assessment, and the mechanics of carrying out classroom research projects. The course includes online sessions as well as an in-person meeting at a regional HAPS conference in the Fall, and your tuition and travel will be covered by the grant. We know that many of you are also teaching during this period, so will be asking to commit no more than 3 hours per week for this endeavor during the Fall semester. By the end of the course (probably in early December) you will have a plan for an intervention that you would like to try out, and evaluate, in your course. While completing the course, you will work with one of the course instructors to refine your classroom research project focusing on your specific student population. Each participant will test the impact of an intervention on student performance (attrition) and stress levels using tools such as validated student surveys, instructor reports, and/or student interviews. We will provide you with a list of interventions and research tools to choose from, but participants are also welcome to come up with their own. For instance, one participant might look at how student stress and performance is impacted by two-stage cooperative quizzes, in which students complete a quiz both individually and in groups (cooperative quiz). Another participant might decide to investigate if his or her students feel less psychological distress, and/or perform better, if they spend 3-5 minutes at the beginning of each group activity discussing their everyday lives. A third might examine the impact of instituting active learning activities, such as those that will be published in an upcoming Special Issue of the HAPS Educator, the inquiry activities on the HAPS website (HAPS Archive of Guided Learning Activities), or the many teaching tips on the HAPS website (A & P Teaching Tips). We will also help you get Institutional Research Board (IRB) approval for your project. Note that interventions will be realistic and achievable – we are looking for small-scale interventions, not changing an entire course. January-May 2019: Carry out, analyse, and write up your classroom research project, with the support of the instructional team. We hope that all participants can present their findings at the 2019 Annual HAPS conference at the end of May, and we also would encourage participants to submit their findings to the HAPS Educator. We will also ask each participant to participate in informal entry and exit interviews, in which your will discuss your perspectives on teaching and educational research with an interviewer. Why? What’s in it for me? First of all, the educational community needs your input, and data from your students, to inform our practices. Second, it will be FUN. Educational scholarship has the potential to revitalize your teaching, and make your job more interesting, challenging, and satisfying. Third, we will help support your travel to two HAPS meetings (one regional and one national), and there will be a stipend for completion of the manuscript describing your work. First, all participants will need to talk to their administrators. They must know what you are doing (research on teaching and student retention), support you in your efforts, help secure IRB / Human Subjects approval for you to conduct your project with students, and work with us to collect data on attrition. Second, the project will work best if we have teams of two or three anatomy and physiology instructors from one community college, city, or region. It isn’t an absolute requirement, but apply with a colleague from your own or neighbouring colleges if you can. It’s even better if your school in involved in a program such as Community College Biology Instructor Network to Support Inquiry into Teaching and Educational Scholarship, or the SEPAL project. And third, please remember that this is a grant proposal, and there is no guarantee that the grant will be funded. We can only accept 6 to 8 participants for the first year, but, if funded, we would run a second group of 6 to 8 participants in the second year. We need to have the list of participants finalized by November 21, so let us know if you are interested ASAP! Consider this post an invitation to submit classroom activities for possible publication in a special issue of the HAPS Educator! Wow. After several years of developing curriculum for the active learning classroom (pictured below) you would think that we would have more than that. Nope. Curriculum development is far from easy; it requires the right combination of students, topics, questions, graphics, and more. An active learning classroom at the University of Minnesota. Nine students sit at a round table, and there are 14 tables in the classroom. The days I use the “Inside and Outside” activity with entry level students I know will be good. And by good I mean students will be talking with each other using the language of anatomy and physiology and there will be many moments where you witness students thinking, doubting, questioning, and even going back and revising answers to previous questions. There will be good questions generated by the students. There will be learning! I use the “Inside and Outside” activity as an introduction to the digestive system, but I have many colleagues in other entry-level classes using it to introduce the respiratory system, others use it to introduce the integumentary system, and a couple even use it on the first day of the semester. The activity involves one graphic and several guiding questions that help students develop a conceptual understanding of what is inside and outside the body and the anatomical barriers involved. The following questions are included; and it’s important to note that the answers to these questions are quite obvious to us (experts) but are quite novel, and sometimes even a bit troubling, for entry level students. Is air that is inside the lungs considered inside or outside the body? Is a piece of gum that is inside the stomach inside or outside the body? Is a fetus developing inside the uterus inside or outside the body? Is a tattoo inside or outside the body? Learning, and more specifically conceptual learning, is slow and non-linear. Students frequently pause, think, ask questions, think some more, and slowly…slowly…figure…things…out. To show this process, I videotaped a group of four freshmen completing the “Inside and Outside” activity. (I especially like watching the body language of students while engaging in good active learning lessons: squirming, leaning in, leaning back, looking up in the air, etc…all evidence that learning is indeed taking place.) It’s painfully slow to watch, and many old-school lecturer instructors would obviously ask “why don’t you just tell them the answer!” Unfortunately, conceptual learning is not that easy; for students to understand a concept (e.g., how do you know if something is inside vs. outside the body), they must construct their own understandings, they must “figure it out for themselves,” and cannot simply be told what to know. A key factor in the success or failure of curriculum is its fit with the students – it’s not a “one size fits all” thing. What provokes and engages students in one classroom might be quite bland and flat in another. For example, advanced anatomy and physiology students zip through the “Inside and Outside” activity and have few, if any, questions. Entry level students, however, work slowly and have many questions, and also have more than a few “aha!” moments. Over the next few years, our research team of Kyla Ross, Ron Gerrits, Kerry Hull and myself, hope to develop a library of curriculum materials for HAPS members. The library will be an on-line collection of curriculum activities that enable HAPS members to pick and choose activities that best fit their students and course goals. We’re starting that endeavor with a special edition of the HAPS Educator that is to be published this Fall. Do you have any curriculum that works? Do you have a classroom activity that is a sure thing in terms of generating classroom conversation? Generating those “aha!” moments? If so, please consider submitting your activity for possible publication in a special edition of the HAPS Educator. We’re starting this process with two activities that can serve as examples. First is the “Inside and Outside” activity that targets entry level anatomy and physiology students, and the second, from Ron Gerrits, is on cardiovascular control and targets physiology students. Both follow the format that is required for the submission process. Links to the two sample activities, as well as more information for activity submission, can be found on the HAPS website. Transforming, or “flipping,” your classrooms from traditional lecture to active learning is a huge endeavor, and you should not try to do it all at once. But with help from colleagues in HAPS, and sharing good curriculum (curriculum that works! ), the process can be a lot easier, student learning can be increased, and you are almost guaranteed to love the conversations and questions you’ll have with your students. 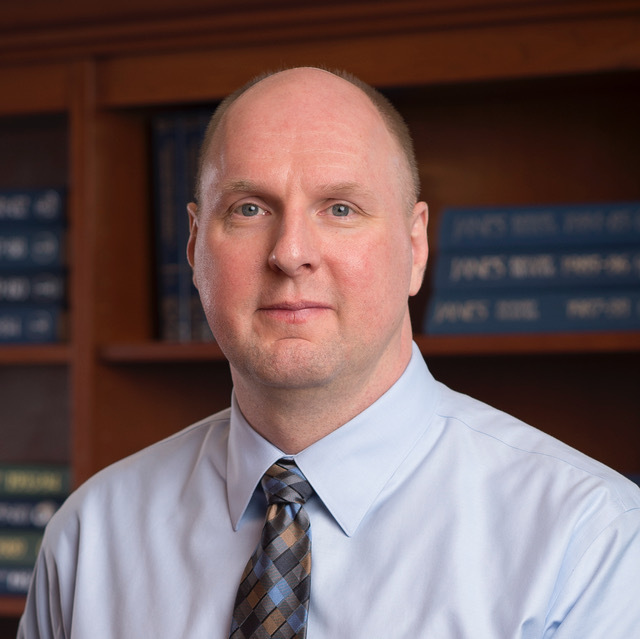 This week’s post is from Dr. Murray Jensen, Associate Professor of Biology Teaching and Learning at the University of Minnesota in Minneapolis. David Brashinger has engineered the 2014 and 2017 HAPS lab instructor survey reports. 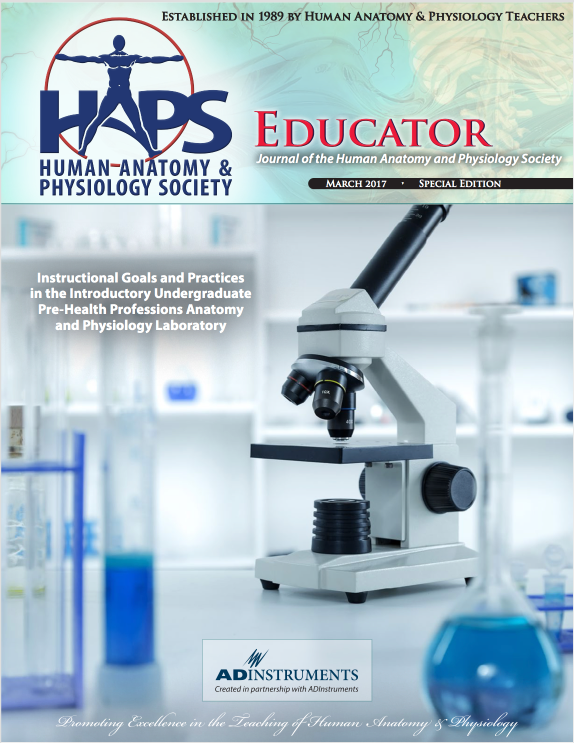 Hot off the digital press…the results of the 2017 HAPS laboratory instructor survey are now available to HAPS members in a Special Edition of HAPS Educator. My thanks to all of you who participated in either the 2014 or the 2017 surveys. This year, we received over 560 submissions from 470 institutions over a two-month period. That’s more than four times the number of participants and more than five times the number of institutions than we had in 2014, and in half the time! Special thanks to the ADInstruments team for their suggested survey improvements and sponsoring the Amazon gift card drawing for our survey participants. The report, Instructional Goals and Practices in the Introductory Undergraduate Pre-Health Professions Anatomy and Physiology Laboratory, contains all the 2016 survey data alongside the quantitative results from the 2014 report. The report is hefty with 21 data tables; however, it was important to share all the data we collected in a peer-reviewed and published format rather than just summarizing a few key findings. The report includes data on the participant population, institutional and program practices, and the instructional goals and practices in the A&P laboratory. I expect you’ll find the data in this report very helpful if you are needing to benchmark your current laboratory practices against the national trends. I also see the report as a foundation for our discussions on what our laboratory practices should be in the future. I look forward to discussing the survey results and our next steps with y’all in Salt Lake City. I’ll be at the poster session during the update seminar portion of the annual meeting and I’m leading a workshop later in the conference. If you won’t be at the annual conference, please feel free to reach out to me by email with your questions and ideas. In closing, I also wanted to take a moment and thank all the HAPS committee members, board members, and administrative staff who worked on the lab survey project over the last three years. This project started with a question I asked Ron Gerrits in 2013. I was still very new to HAPS and it was my first annual conference. Looking back reminds me how welcoming we are as an organization and how much we accomplish as volunteers in HAPS. If you’re not already on a HAPS committee, review the committee list on the HAPS website and consider joining one of these fantastic teams. The committees meet in person at the annual conference, but you can still get involved even if you’re not headed to Salt Lake City this year. Just reach out to the corresponding committee chair using their contact information on the HAPS website.